New Wave/Pop Punk from Sweden? Now I have seen it all. 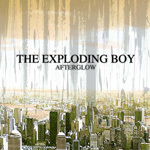 And since seeing is believing I had the pleasure of listening to The Exploding Boy's second album Afterglow. The quartet offers brilliant 'modern U2 style' new wave with a few pop punk influences. Three guitars, a synthesizer and a drum machine make up most of the music on Afterglow. The lack of bass is felt throughout but never brings the band down. The synth is played in classic new wave fashion, just the way it should be. The same goes for guitar, except in 'Desperados' and '40 Days.' 'Desperados' features great lead guitar that fits perfectly into the song. '40 Days' is the biggest departure from the sound of the rest of the album. It's a bit punk and seems rushed compared to the mellow tones and sounds found on most other tracks. This is a very good thing, offering change and variation on the album. Afterglow is sure to spawn a few singles. 'London' has a great beat, an excellent foot tapping song. Others, especially 'The Right Spot,' have great choruses. Swedish new wave revival is something I never saw coming and lucky, The Exploding Boy does it very well. The band is sure to have some great hit singles and another hit album. This one is great and fans of new wave and other similar genres will love it.